Recently we got a chance to read a book named March To Opulence. It is a compilation of stories from around the world. It includes fairy tales, folklore and popular stories by well-known authors. The aim of the episode Parikshit Nagesh Samant behind collecting these stories and present the compilation of the same in a form of book is to make them available in a single book, so readers from various age group can access them all together. Often these tales, otherwise, remain within the geographical boundaries. I, personally admire the intentions of Mr. Parikshit. Reading this book reminded me of the famous Hindi TV Serial – Katha Sagar. And, I am sure that, many readers will remember the same while reading this book. The stories in March To Opulence are distributed into 3 segments, each targeted to a specific age group. Today, let us talk about its first segment which is meant for Children and Young Teens. I will try to avoid as many spoilers as possible, but you may find some of them though :). The first story explored in this segment, and in the book, is taken from The Jataka tales. Jataka Tales are similar to Panchatantra tales. Each Jataka tale is intended to convey a wisdom lesson. One thing you will notice in all Jataka tales is the reference of Gautam Buddha and Buddhist way of life. Considered as the 9th avatar of Lord Vishnu, Buddha conveyed the message of brotherhood and peace. It is said that these tales were told by Gautam Buddha to his disciples. This tale explores how Bodhisattva met a demon on his way and fight him. When Bodhisattva was caught in a way that he cannot get himself free and the demon asked him why doesn’t he fear to meet with death? The answer from Bodhisattva was legendary. He says that In one life a man can die but once. Very true, and then there are the references of knowledge and courage there in the story. Overall, a small yet nicely written story, which is a good read. This tale is little more complex than the previous one. Here a few peas are there as main characters. It shows how the peas are grown and how they see the world based on their surroundings. This tale thus conveys a message that we develop perceptions and gain knowledge based on our surrounding and circumstances. All the peas are then met with different fate. Whether the efforts are more important or luck? Is aiming high a good thing or bad? The tale is not very conclusive like the previous one, however children may find it interesting. This tale is written to introduce us to Issac Newton, one of the most intelligent men of his time. This story explores the incidents happened in the early phase of Newton’s life. It is interesting to read that how he developed interests in finding ways to ease the day to day tasks and how eventually it leads to some concepts and products, among them, some are left at early stages due to various reasons. It is an inspirational tale and we recommend reading it. When referring Arthur Conan Doyle, it is obvious to think about Sherlock Holmes, the numero uno fictional detective (and his aide, Dr. John Watson) created by him. This tale, however, doesn’t belong to Sherlock and it is even not a detective fiction or thriller. As the name suggests it talks about the game of Cricket. Doyle here tries to explore the knowledge of Cricket and various cricketers through a conversation between a father-son. The tale is written by keeping in mind that the reader has the basic knowledge of the game of Cricket. While it talks about some interesting facts and remarkable cricketers (of that time and earlier), I was disappointed. I’ve definitely expected much better tale. This is one more tale from the Jatakas. This inspirational tale shows that how a person starts a business from almost nothing and eventually becomes a wealthy fellow. Some may find this tale a quite superlative and think that such things happen only in stories. The tale is written in an interesting manner. Though, I feel that instead of a mouse, there could have been something else as the base. It is important to think out of the the box. It is important to take calculated risks. In short, it is a tale which conveys some important life lessons and is worth reading. Written as a conversation between an old man and two children, this tale is aimed to understand and respect the nature. Possibly the best things we are encountered in our lives are available to us for free and thus we often could not understand their importance. In addition to remind us about the beauty and boon of nature, this tale also conveys that the real knowledge comes through experiences before it is documented. While one should learn from the written knowledge, one should also make sure to experience some of the underrated stuff in the life, to enjoy it fully. At the end of the tale, the author also refers one of the famous quotes of Chanakya, the visionary economist and intelligent politician, about the importance of knowledge. You should not miss it. The Ugly Duckling, is, of course, a story of a duckling, but it is much more than that. The Ugly Ducking here is a metaphor of the average looking (or even physically disabled) people we came across with in our lives. It is our tendency to praise the beauty and thus we often neglect what is not attractive. We often forget that physical beauty is not the only important thing in the life. Had we ever thought about the people on the receiving end? They definitely feel low when neglected, and often, it leads them to depression. In this tale various life experience of a duckling and how eventually it found the real happiness are explored. Rather than telling much about this tale, I recommend you to read it. The story is definitely worth reading. Reading this tale will remind you the incident from Mahabharata, where Sahadev, Nakul, Arjuna and Bheem all got unconscious by drinking water from a pond own by a Gandharva (by disobeying his instructions to answer his questions before drinking from the pond). Eventually, the eldest Pandava, Yudhishthir (or Yudhishthira) came and answer all the questions and get them back to consciousness. The tale is little longer and little more complex as it spreads through many births. The essence of the story is one needs to do the right things. It is a worth reading story which talks about morales and ethics. Alice in Wonderland (or Alice’s Adventures in Wonderland by Lewis Carrol) is very famous amongst the kids of western countries. The experiences Alice had in the Wonderland unbinds the imagination in the kids. They love to explore the magical world where things happen quite interestingly. There are many TV Series and Movie adaptations came to existence based on it. This story explores the incident where Alice meets a Caterpillar in the wonderland. How she found it offending and egoistic, how she talks to it and eventually how she learn the things, is explored in nice words. Children love such tales and they will definitely find it worth reading. The Happy Prince is a famous story by Oscar Wilde. It is about a statue of Happy Prince and a swallow. When everyone in the village suffers, they both does humanitarian work selflessly and ultimately their work is recognized by the God. The story is little more complex than the others we talked about. Though written nicely, children need to pay attention to understand the things. May be reading twice will make the things clear. Overall a nice story which talks about working with selflessness. Rose Of The Evening is a little complicated Chinese fairy tale. A boy eventually falls in water and discovers a new world inside. There he meets “Rose Of The Evening”. Who is she? Will the boy be able to come out from the water at all? What will he witness if he can come out? The tale ends with the confirmation that spirits doesn’t have a shadow. You need to read the tale twice to understand it properly, especially if Chinese names are tough for you to remember. You may avoid reading it. Tom Sawyer and Huck Finn are two popular characters created by Mark Twain. In a book named The Adventures of Tom Sawyer (which is focused on Tom Sawyer’s adventures, as the name suggest) Mark introduced the character as Huck Finn. He later wrote a dedicated book on Huckleberry Finn which became even more popular. Some considers Finn as one of the most popular American character in literature. The original book about Tom explores many incidents inspired from the childhood of Twain himself. Written interestingly, Introducing Tom Sawyer, is a nice tale you would love to read. The legend of Yamato Take is quite popular in Japan. Some historian draws parallel between King Arthur and Yamato. His original name was Osu. Actually he slayed his elder brother and thus his father, feared from him sent him to other place(s). He eventually conquered his enemies and awarded the name Yamato Take. This tale is available on YouTube’s public domain. Written nicely, this tale will attract the children who love to read adventure stuff. Many readers will find it difficult to remember Japanese names but if you read for a couple of times, it will be easier. Overall the book gives good reading experience in terms of its first segment. 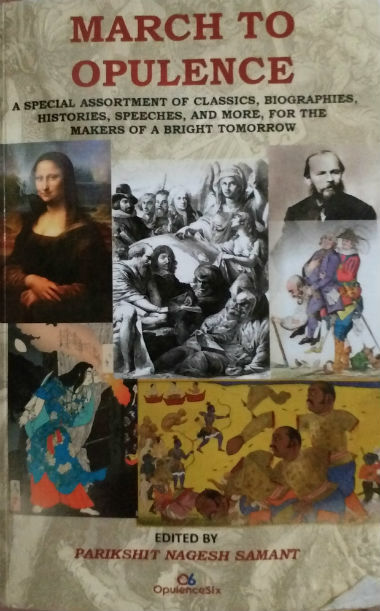 It is a collection of tales from around the world which are popular in their own domain. This positive point itself sometimes works as the negative point as many readers find it tough to remember non-native names. To help them, there is a small (1 – 2 paragraphs) introduction is there along with each tale which is written in simple words. Also at the end of each story there is a small segment which is like “brain storming” which talks about the attributes mentioned in the respective tale and also raises some logical points and questions. I think that rather than making a pricey (its price is INR 500 for Indian Edition and $22 for US Edition) single book, if a series of three books (one for each segment) is published, it could have been a better marketing decision.